I’m the luckiest lady to have finally met the hip lovechild of a lemon and a mandarin orange. I had three Meyer lemons and wasn’t about to waste a pinch of zest. And I’ve got these blueberries that are better than I’ve ever had. Elliot agrees. He likes for me to roll them into the living room so he can chase them. I decided to dot the scones with blueberries instead of mixing them in. 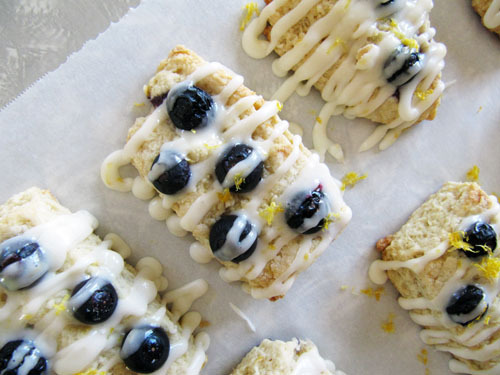 These are polka dotted scones, now. Pretty fashionable, right? These taste like summer sun and make me look forward to things like walking Elliot and sipping my morning coffee in the backyard. 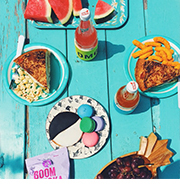 You guys like when things taste like summertime, right? Now I just need the mitten to warm up. Preheat your oven to 400°F. Line 2 baking sheets with parchment paper. In a medium bowl, whisk together flour, baking powder, baking soda, and salt. Rub the zest into the sugar until fragrant. Whisk into the dry ingredients. Add butter and toss to coat, breaking up the larger pieces of butter with your fingertips. Add 5-6 tablespoons of lemon juice and stir, add more/all of the lemon juice as needed. If the dough is still a bit dry add milk 1 tablespoon at a time until a dough forms. Pour onto a floured surface and knead until pliable. Pat into a rectangle about an half an inch high. 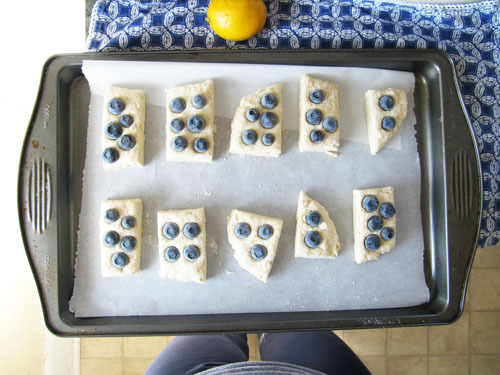 Press blueberries into the dough and cut into squares. Bake for 20-22 minutes, or until tops are lightly golden. Allow to cool on a wire rack. 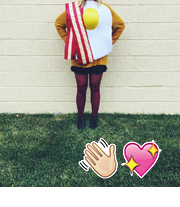 Get glaze-y with it: na-na-na-na-na-na. Combine melted butter and 3/4 cup powdered sugar and mix with an electric mixer until combined. Add zest and juice and mix until no longer lumpy. Add remaining 1/2 cup powdered sugar 1/4 cup at a time mixing between additions. Drizzle over the scones and sprinkle with zest. 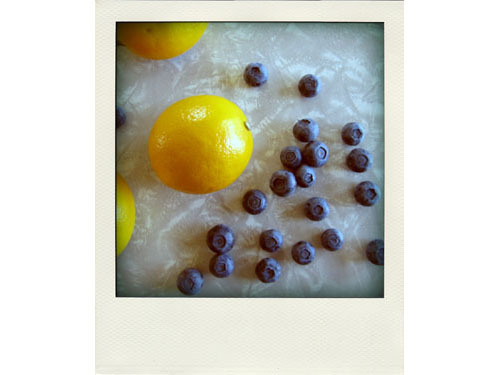 Meyer lemons and blueberries are a lovely combo. meyer lemon! 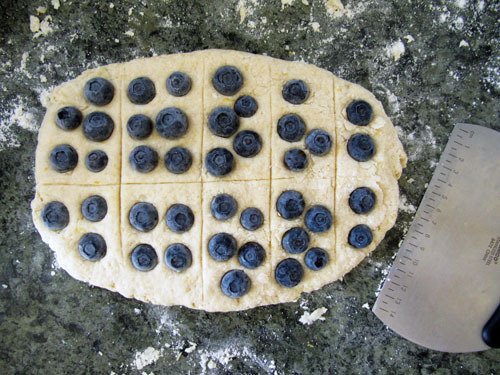 i love the polka-dotted blueberries…def fashionable. those scones look straight up amazing and I want to eat them. Oh, if only we were neighbors Laura! 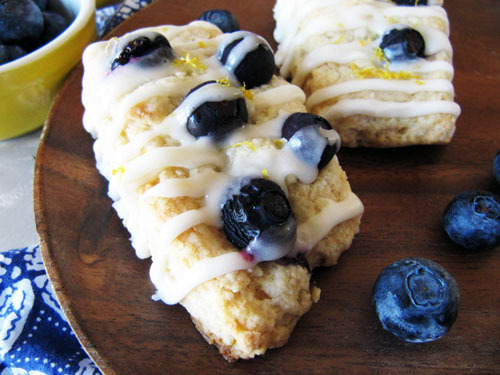 Yum, lemon and blueberry must be on our minds since it’s spring. 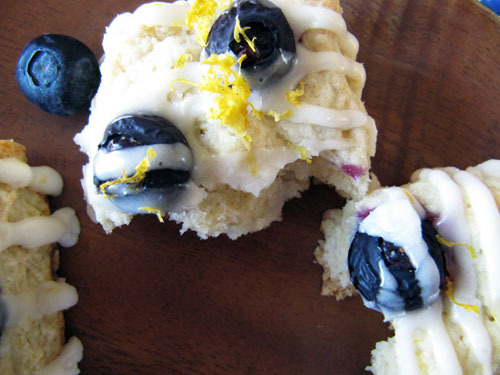 I just made lemon-blueberry doughnut holes and I can’t stop eating them! I bet you’re right. Happy Spring! Those doughnut holes sound like the dreamiest! These look good! My kitten Chai likes to play with food, too– he especially likes to chase chickpeas around the kitchen. I bet he’d love to play with blueberries as well. Elliot is a cute name for a dog. Aw, your kitten sounds like the cutest! And thanks! Elliot is quite the gentleman. Meyer lemons! They are so wonderful! And I’m glad you didn’t mix the blueberries in. They’re perfect this way. And Elliot, why do you have to be so darn cute?? Can you believe this was the very first time I ever met the hybrid jerks?